Every golfer has power.. the hard part is finding it. 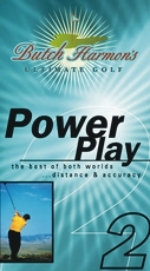 In Power Play, Butch Harmon imparts to you the same instruction that the most powerful golfers in the world use everyday. Through simple lessons and drills, Butch will help unleash the power you never knew you had. Equally important is being accurate with those powerful shots. A long shot in the middle of the fairway not only puts you in position to scores, but it's also a lot of fun! Butch's proven methods to distance and accuracy will give you a priceless confidence in your power game and ultimately lower your scores.